Vegetarian food can often get overlooked when writing about restaurants, if you have one opportunity to test the skills of a kitchen you veer straight for proteins. I can’t see myself doing away with meat and fish, it being a big part of my life in food, I do love vegetarian dishes. Some of the most memorable plates of food I have had are vegetables treated innovatively with stunning flavour. Despite this I can’t recall venturing to a meat free restaurant, Cafe Roya is just that. 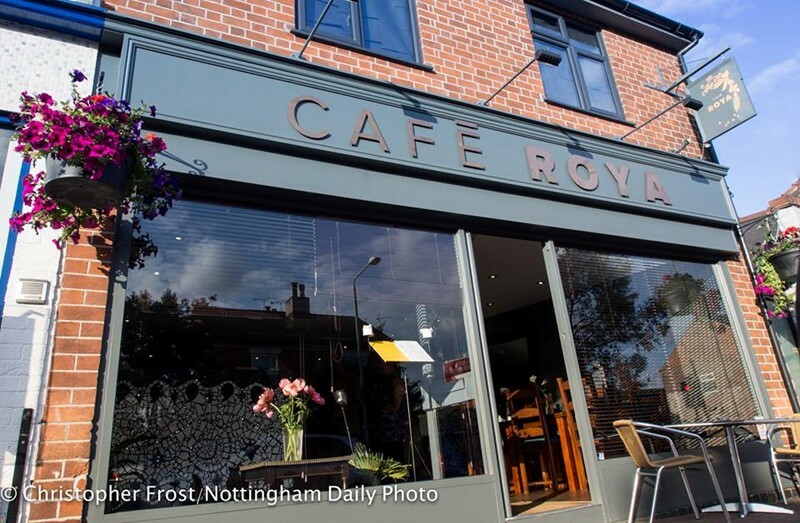 Situated on the main road through Beeston Cafe Roya purports to be a Persian establishment and although the food is actually wide ranging, though there is a sense of Persia in the decor. The menu changes on a monthly basis with 3 choices per course and a more regular specials board, which is always a good sign. 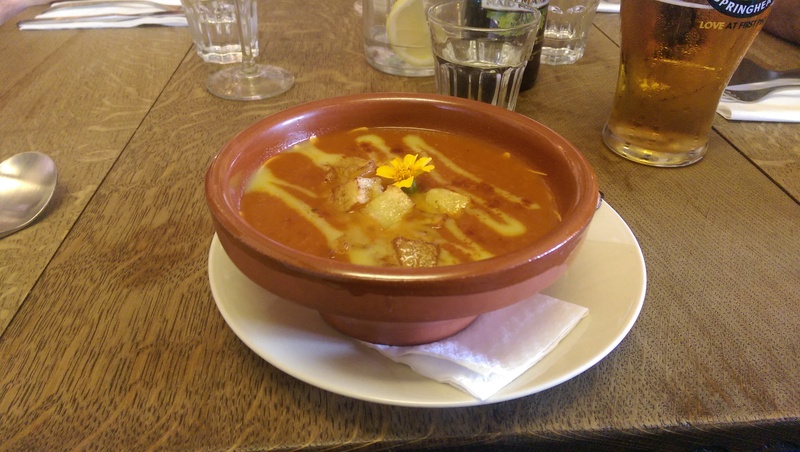 Food sees influences from all over; my starter, a “patatas bravas” soup, was a spicy tomato number cut with a punchy garlic aioli and potato croutons finishing the resemblance to the classic tapas dish. My fellow diners took their choice from a little closer to the restaurants would-be roots. Lebanese Kousa Mehche were a good example of a stuffed courgette by all accounts. 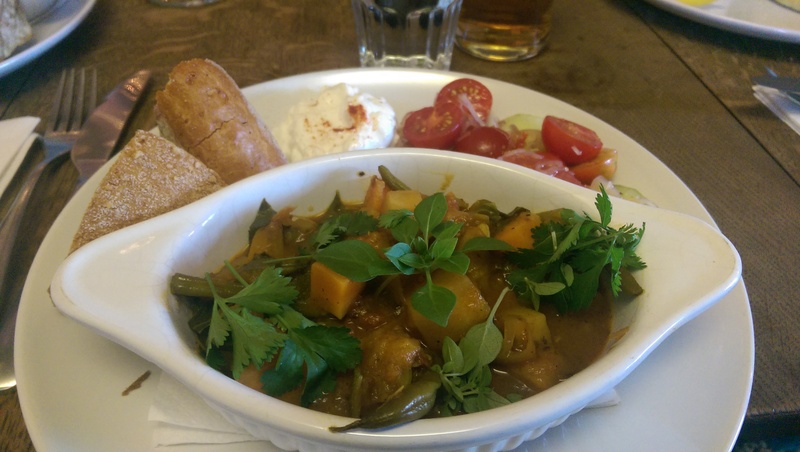 My main was an intriguing special of Ethiopian Wat with cottage cheese, a combination I felt confident wouldn’t be being enjoyed anywhere other than Cafe Roya. The Wat itself was a stew/curry with green beans and root vegetables bought together by a lightly spiced sauce. Pleasant though it was it is questionable when the most memorable part of the dish was the accompanying salad, though the good quality tomatoes and sharp dressing were spot on. 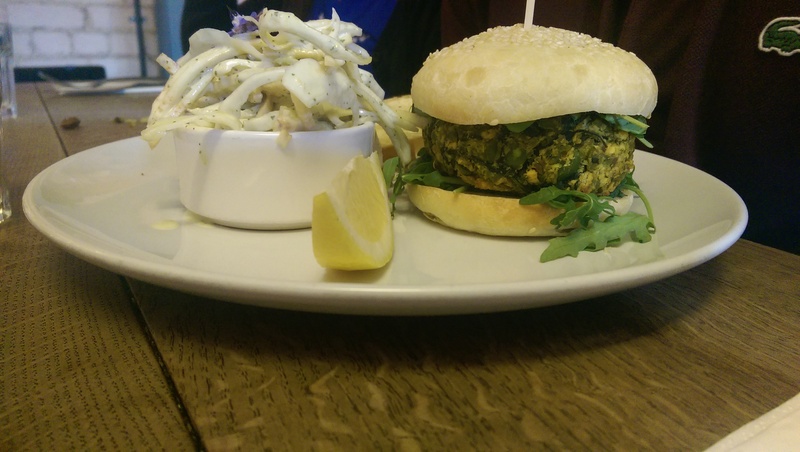 Other mains were a Malay Nasi Goreng, a broad bean burger and a mezze. 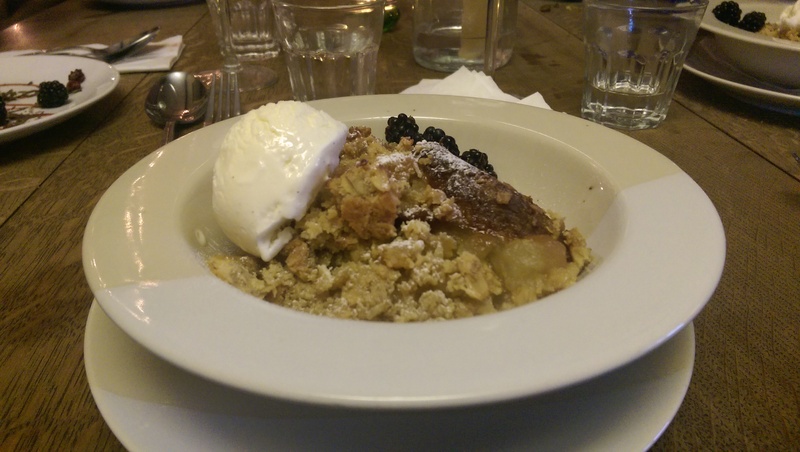 Between us sampling the whole spectrum led to a similar conclusion to me, my Wat and I.
Dessert bought me back in geography to the UK and in memories of childhood, apple crumble. Regardless of what it evoked it was course of the evening. The crumble topping itself, in this case oaty, leant the right texture and in correct proportion. The fruit well judged, retaining a hint of sharpness and the odd fresh blackberry adding a pocket of flavour. A thoroughly satisfying dessert. A cherry cake and kulfi were also hits. I’ll be honest at this point, if I were with carnivores I doubt I would choose to venture to Cafe Roya but I would happily return. It’s eclectic menu from all over the globe doesn’t make for perfect combinations and elements of dishes such as my cottage cheese didn’t quite work for me. The pricing is about right with a rather specific £6.20 for a starters and desserts and £11.25 for a main courses. What the restaurant does off is something vegetarian and vegans rarely get, choice. I am sure often there is only 1 vegetarian option, perennially different combinations of ingredients with goats cheese, on menus. This is the luxury Cafe Roya provides and whilst there is the odd missed step I can understand the appeal.